On October 7th conservative churches all over the country will pound their pulpits in an action called Pulpit Sunday, not with calls for the individual sinner to ‘turn to the Jesus’ or to repent for one’s sins, but that their congregation act as a collective and mark among their religious duties voting in the matter their church leaders direct. Undeterred by the strong evidence (in writing) that the founders of the country had no interest in mingling church and state, the religious right has continued to characterize their movement as one to defend a nation they view as divinely inspired. Once simply a faction of heavy-handed Protestantism relegated to country churches, revival tents or low budget television, the evangelicals, fundamentalists and “charismatics” have forged a unified strength built from their shared vision of America and a never-ending thirst for power. Grown from decades of practice in the use of modern media such as radio and then television and the privilege of a tax-free ride on the backs of the public, the Christian far-right has become a meaningful and forceful part of the political landscape, supporting Republican causes. Right around the time that fundamentalist and evangelical leaders began to develop followings through the use of media such as television and wide scale network radio broadcasts, the Johnson Amendment came to pass. Restricting the ability of tax exempt organizations to engage in political campaigning or directly support political campaigns, the amendment immediately blunted the Christian right’s ascendancy to political power. While the right likes to say that Johnson had no intention of restricting the free speech of churches, but instead wished to curb the activities of senatorial opponents on the left, not one shred of evidence has ever surfaced to prove this claim. 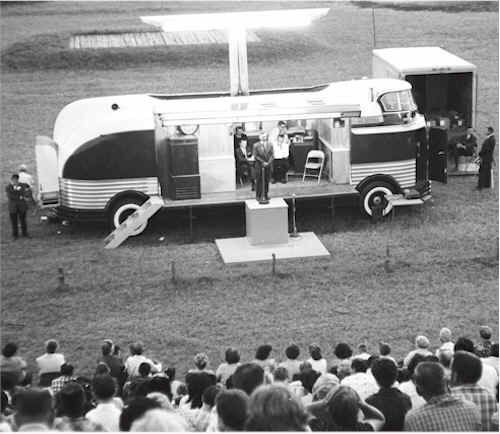 Early Pentecostal Evangelist self appointed “faith healer” Oral Roberts on the road in the 50’s; the modern revival tent. “God said, ‘I told you to raise $8 million to carry on my medical work. You have from January 1 to March 31 to get it done. If you don’t, then your work is finished, and I am going to call you home.’ – Oral Roberts in 1987 raising funds for a ‘medical mission’, telling his television audience that God would be done with him if he didn’t raise the money. Roberts raised the money and lived. In addition, the Christian right and the Republicans like to claim that the Johnson Amendment hampers free speech, but a cursory look at the amendment’s wording makes clear such is not true. The amendment restrict direct activity on behalf or against a candidate. But the religious right, bounded by its belief in its divinely inspired purpose, pushes on. Since 2008, James Dobson, the founder of the radical right wing group Focus on the Family, has taken upon his shoulders the effort to destroy the wall between church and state by force of action by putting his backing and funding behind the Pulpit Sunday action. Since far right wing churches have repeatedly attempted to force the IRS to rule on the issue, a bait it seems to refuse to take, the new tact seemed to be to force the issue to court by practicing flagrant defiance of the law. The way in which the religious right characterizes the amendment and its interpretation, one would think that state’s militias stand outside the door of every right-wing church in America waiting for preachers to make banned utterances over the pulpit. Or cops and IRS regulators attending services and pouring over sermons to find a shred of prohibited speech. Skilled in the art of hyperbole, church leaders characterize the amendment as crushing speech critical of any political agenda. Anyone who has watched mainstream media where right-wing preachers have received nothing short of a megaphone for their fundamentalist soapboxes knows this untrue. With the help of expanded media exposure and cable television, the Christian right has grown from its hill-billy roots into a multi-million dollar business venture supported by member/supporter donations. One must differentiate between the traditional church member who attends and participates in a traditional church community and the supporter who responds through media to televangelists who plea for donations, usually in exchange for either something tangible or the privilege of having a wish or prayer granted or heard. 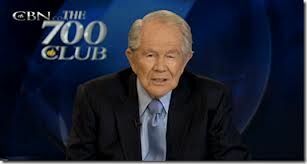 From the Jimmy Swaggerts to Jim Bakker, whether exists the old style preacher or the hucksters– no personal connection or community exists among the media driven donors. One would typically characterize such as regular commercial transactions, but under tax code, the church needs pay no income tax. The potential power to gain as a constituency with such money became self-evident when in 1980, Ronald Reagan walked into the White House with the religious right at his side. 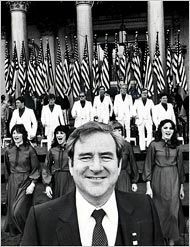 Jerry Falwell (and here), Pat Robertson (and here) and a young upstart named Ralph Reed worked together and formed the Christian Coalition, that not only helped propel Ronald Reagan into office, but also melded far-right religious theocratic tendencies with the Republican party. The result was immediately palatable. The American culture fell in love with conservatism and embraced a media driven new conservatism. Exhausted from long unemployment, inflation, war and social upheaval that demanded core cultural changes many resisted, Americans embraced the new turn backward. The media wizened far-right Christian leaders played the public like a fine tuned harp and out flowed a mythology of America that soothed the troubled American mind. The social backlash of the 1980’s and the roll of the evangelist movement within cannot be understated. Randall Terry, the founded Operation Rescue, a group that led the charge early to take a militant stance against a woman’s right to bodily sovereignty by committing and/or supporting terrorist acts against or harassment of women, doctors or clinics who served women. Propelled by the love-affair with the far-right, the media became a willing dupe, eagerly using their framing of social programs such as affirmative action, cuts to assistance programs to poor, in racism terms (the religious right is no stranger to supporting the powerful and has a strong following among poor whites, usually the most racist in the country) attacks on unions and even attacks on environmental legislation and policy, championed by controversial Interior Secretary James Watt who typified the new culture of conservatism. All the while, hyper-nationalism mixed with religious conviction gave justification for a huge military expansion. The doctrine of the evangelical right of the blessed sanctity of capitalism laid the groundwork for plowing through nearly a century’s worth of struggle to create government regulation to balance out the barbarian narcissism inherent in capitalism. The response of the center-right in the Democratic party was to chase the bandwagon and jump on. Many key Democrats couldn’t trample workers, poor folks, women’s rights, civil rights, environmental protections, anti-militarism and many other once core liberal beliefs in their clamoring to please the powerful formed the Democratic Leadership Council (which in the 90’s morphed into the “New Democrats”). All the while Reagan attacked years of social progress from within by defunding, denouncing and destroying every possible law, regulation and agency that threatened corporate profits. The far-right served the corporate agenda by distracted the public like a side-show act during set changes with assaults on clinics, hatred toward gay people (and the ensuing delay on the part of Reagan to act on the AIDS crisis), attacks on affirmative action and the growth and development of “think-tanks” such as the Cato Institute or the Heritage Foundation to bolster activists and politicians with manipulated numbers, half-truths and mythology to sway public opinion. The growth of evangelical and fundamentalism cannot be understated, nor can its intention to control government policy be over looked. The power of extremist Christians built with their skillful use of media and money deserves serious attention. American Christian culture has deep roots in a mix of Calvinist individualism and pre-destination and the Puritan belief that God speaks through the dollar which has allowed evangelicals to amass fortunes with only passing amusement from most of the public. No one can doubt that the tax exempt status such churches enjoy helps substantially with their portfolio expansion. 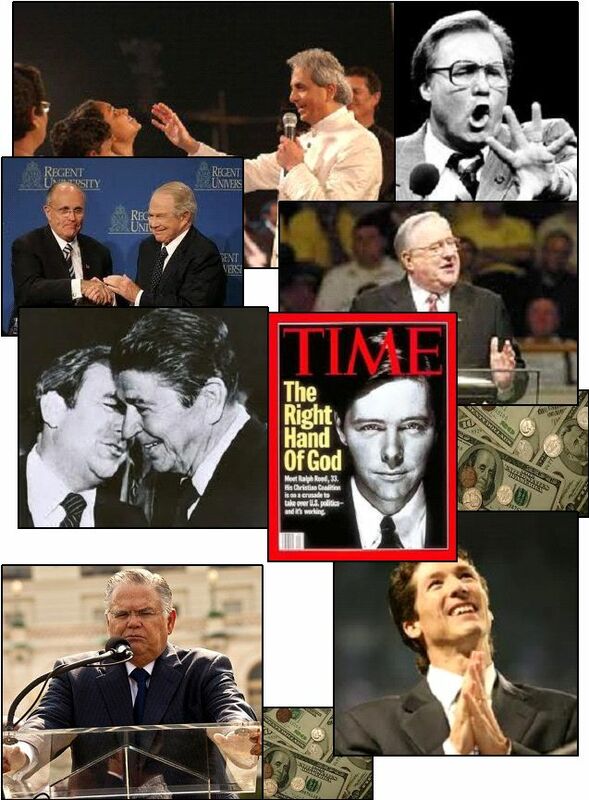 In the 1990’s, Ralph Reed’s Christian Coalition nearly lost its tax exempt status over voting guides which they distributed nationally to fundamentalist and far-right churches. In contradiction to the wording of the Johnson Amendment, the voter guides had direct instructions as to what candidates the congregants should support. Currently Ralph Reed has resurrected the voter guides and has bragged that distribution through media such as cell phones has the potential to reach as many as 3 million voters. The IRS has not come knocking — yet. As long as Reed’s group does not actively support one candidate over another, they can continue to operate. In fact, preachers have been and are quite free to propound endlessly on social issues of their choice and extol their faithful followers to view certain policies or social activities as alien to their beliefs. Ecumenical groups on both sides of the aisle regularly engage in social criticism that goes into or borders on commentary about the political. While most mainstream protestant churches shy away from such, far-right religious establishments have made political and social commentary their brand du jour. Jim Garlow, pastor of the Skyline Church and one of the leading preachers to take the mantle as promoter of the pulpit event and aleading proponent of the California Prop 8 which banned gay marriage, is seen in this video explaining the Pulpit Sunday event. Implicit in his speech lies the assumption that American society must act in obedience with their interpretation of their holy text. No where in the screed is mentioned the factor of tax exempt status which allows the churches to amass millions of dollars, to fight these battles they see as their own personal jihad against western secularists. Presently the legal action arms of the Christian right has focused legal battles across the country in small municipalities to in a concerted, long battles to erode the separation of church and state. Lawyer James Sekulow has made a fortune with two charities that have made frightening inroads into the mixing of the public funded sphere and the religious. Most importantly, religious fundamentalism, interprets the bible as the real voice of their god, sacred and unquestionable, most religious fundamentalists resent the mandated obedience of a secular government. They instead envision not a secular and broad democracy as laid out by the constitution and the bill of rights, but a theocracy more in line with the social orders described in their holy text; the bible. As a form of revolutionary control, since the 1980’s, corporate capitalists have increasingly found that their brand of capitalism, American exceptionalism and religious evangelism, particularly the “prosperity gospel” brand, can run hand in hand. Since extreme, unregulated capitalism resents government regulation as intrusion, so do religious extremists. Both envision a country where their world view and vision can exercise without ‘interference’ of an objective body protecting the rights of all minorities. Thus, they have melded and capitalists have come to see the potential voting block of the religious right and right wing libertarians as useful to build the state in their model of control for the extraction of capital; the exchange would be suppression of the population through theocratic control. We encourage all readers to attend a fundamentalist or evangelical church in their neighborhood on October 7th to get a feel for the kind of world these people wish to use the government to enforce on all of us. Capitalism and Christianity – for an interesting observation of a left religious European blogger and American Christian readers. Amazon.com reviews of “Money, Greed and God: Why Capitalism is the Solution and Not the Problem”, David Bahnsen that will make your hair curl. Tennessee Lawyer’s Family Firm Collect Millions from Charity, USA Today.com from the Tennessean, 9/5/2011 – story of Jay Sukelow and his questionable practices in handling Evangelical based charities and the rise of his “charities” that offer legal work to evangelical Christians, mostly opposing separation of church and state rules. SBOE Votes Down Church-State Wall in History Books, , The Texas Tribune, 3/11/2010 – old but an example of the infiltration of right-wing Christian ideology in education.